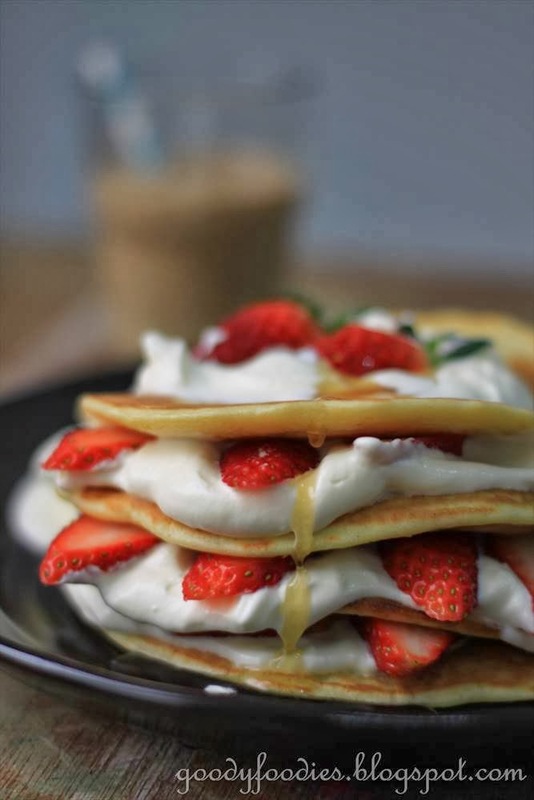 In United Kingdom, Canada, Australia, Ireland and New Zealand, Shrove Tuesday is also known as "Pancake Day" due to the tradition of eating pancakes on the day. This morning, Hubby whipped up some lovely pancakes for our breakfast. We are using Jamie Oliver's American pancake recipe which I have used several times in the past to great success. The pancakes are thick and fluffy, and Hubby says they're just like the ones his grandma used to make him. Korean strawberries are in season (my fav! ), so I sliced them thinly and layered it between each pancake with some whipped cream, before a final drizzle of honey (or maple syrup) on them. So very delicious.... what a great way to start the day! The pancakes are also great with some butter and homemade roselle jam(recipe coming up soon!). 1. First, separate the eggs, putting the whites into one bowl and the yolks into another. 2. Add the flour, baking powder, sugar and milk to the yolks and mix to a smooth thick batter. 3. Whisk the whites with the salt until they form stiff peaks. You can use an electric whisk, so this can be done in no time at all. Fold the egg whites gently into the batter – it is now ready to use. 4. Heat a good non-stick pan on medium heat, then add a drop of oil. 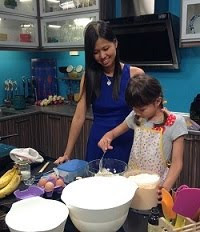 Using a ladle, pour some of your batter into the pan and fry until it starts to look golden and firm, then flip the pancake over and continue frying until both sides are golden. 5. Using an electric whisk, whip the cream with icing sugar until stiff. 6. 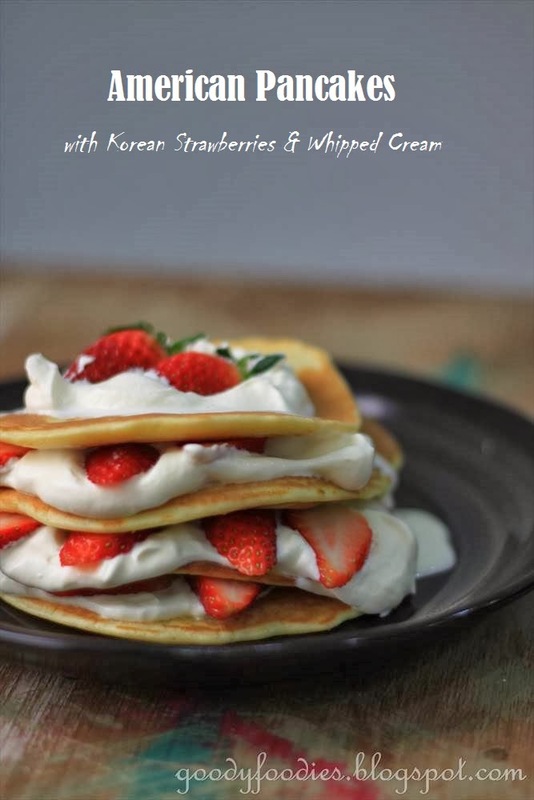 Place 1 piece pancake on a plate, then top with a dollop of cream and strawberries. Repeat with another 2-3 pieces of pancakes until you get a nice pancake stack. Drizzle with (or maple syrup) and dust with some icing sugar. Serve immediately. Note: You can also serve with crispy bacon (as seen in post here). 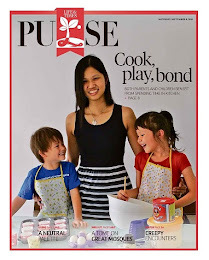 I am submitting this to the "Cook Like a Star 2nd anniversay" event which is hosted by Zoe of Bake for Happy Kids, Joyce of Kitchen Flavours and Mich of Piece of Cake. Yen, this is so tempting. 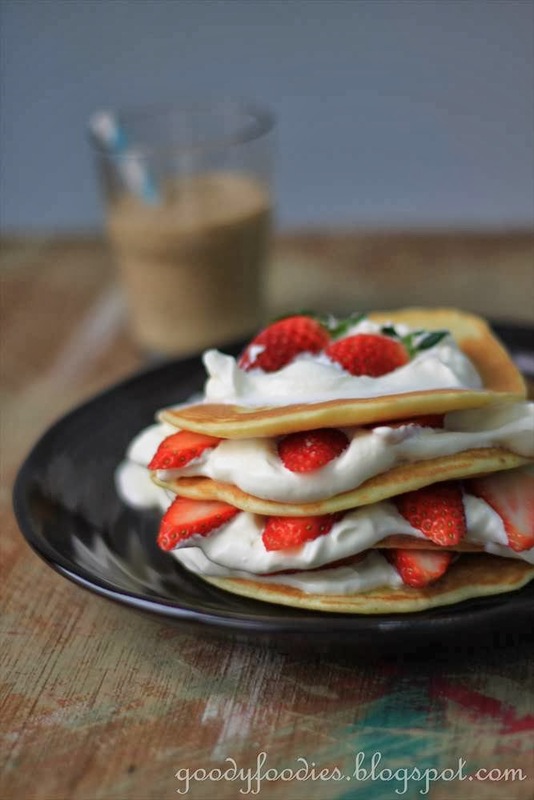 Love strawberry with whipping cream. The sound simply perfect for a lovely morning breakfast! Yum! 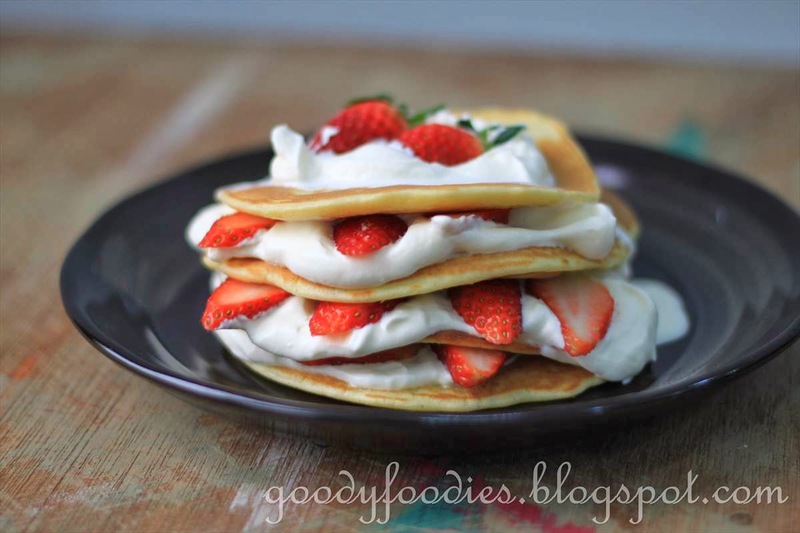 Strawberries on freshly whipped cream and thick fluffy pancakes just like grandma's. Perfect. Yen, my son was given a pancake today by his caucasian classmate, not sure whether is due to the Pancake Day so when I picked him up after school, he begged me for making pancakes for him, hahaha. I told him that I only have time to do it on the weekend. I always heard that Korean strawberries are sweet. The colours do look very red, hmmm, the plate of pancakes is full of love! Should be..the angmohs always celebrate Pancake Day esp if they r Christians. How lovely of your hubby! 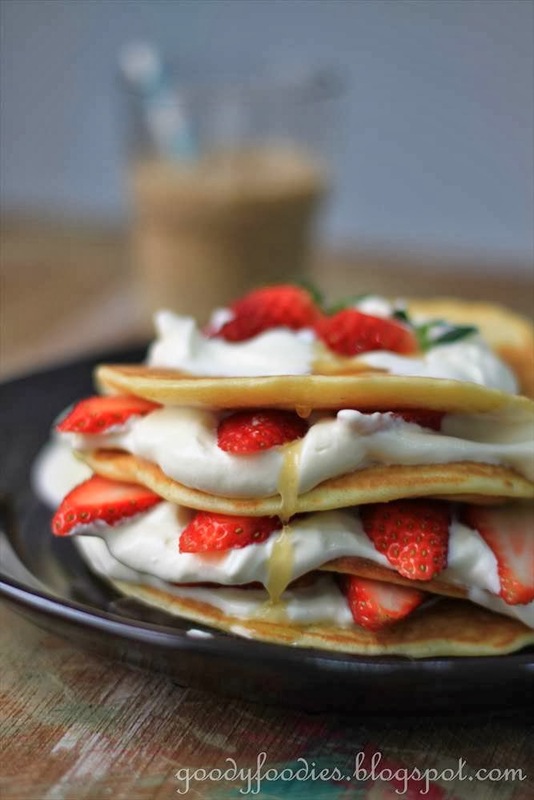 Very nice pancakes, looks utterly yummy with the cream and strawberries. A perfect start to a day! Lovely! I use ENO instead of the pinch of salt, makes the pancakes fluffier. Wah...I can have this anytime ! ahh, with a cup of good coffee and this will be perfect! What a fabulous looking recipe! You've talked about Korean strawberries before and I'm still really intrigued by them. I don't think we'll get them here though. I might have to wait until I get to Asia. How long is the season? If I remember correctly, we can get them twice a year... about 3 months each time. 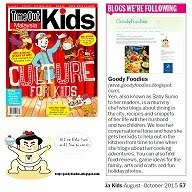 My kids have been asking for pancakes and I have no time to make them! Your pancakes look so inviting.